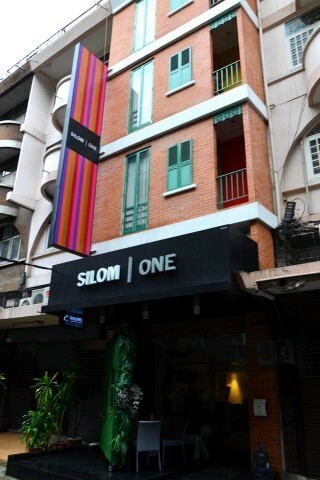 281/15 Silom Soi 1, Bangkok T: (02) 635 5130, (02) 635 5131 F: (02) 635 5132 info@silomone.com? Silom One Hotel is one of the only options if you want a comfy room within a few steps of Sala Daeng BTS station and the vibrant atmosphere that surrounds it. The super-convenient location does however mean that you’ll have to part with more cash than at some of the other small hotels in this general vicinity. Occupying a converted shophouse-style building on Silom Soi 1, the aptly named 10-room property has a sharp multi-coloured sign that grabs the eye on this otherwise featureless lane. Apart from the urban-inspired signage and a funky plastic bench with the shape of a dog’s head for an armrest in the tiny lobby, this is more of a straightforward small hotel rather than a real boutique hotel. The two staff members who we’ve encountered were polite but spoke only basic English. If they can’t answer your questions on dining and sightseeing in the area, perhaps the two shared computers and free WiFi will. A small but shiny lift takes guests up to the upper floors, each with only two rooms on either side of the building. We were impressed by an immaculately kept deluxe with lightwood floors and furnishings, including a desk, small daybed and long shelf with an LCD TV. The bed felt comfortable and the modern hot-water bathroom was of a decent size. An array of different lamps will help to make up for the minimal natural light that shines through one small window. All rooms are equipped with mini-fridges and hot-water kettles, but no in-room safes; we were told that guests could deposit valuables in a larger safe at reception. We had a hard time deciphering what made the “deluxe” different from the “superior,” as both are similarly equipped and the deluxe is actually smaller by a few square metres. An included breakfast is served downstairs in a cosy dining room. While Silom One’s value is reasonable given the location and room quality, you will pay less for similar accommodation at Mirth Sathorn and Park Saladaeng. The trade off is that both of these require a solid 10- to 15-minute walk from the skytrain and are harder to find. In addition to the BTS station, Silom One puts you within a quick stroll of one of Bangkok’s most bustling dining and nightlife areas. Check rates at Silom One Hotel on Booking.com.